Anyone who has been up to Schweitzer Mountain Resort knows that the ski area-turned-year-round tourist attraction isn’t exactly in Sandpoint. Rather, it requires 10 miles of switchback travel on mountain roads and an elevation gain of about 2,700 vertical feet to reach the base village. Over the years, Schweitzer’s village has expanded into a bustling mini-city of its own, replete with restaurants, hotels, condos, bars and shops, keeping many winter travelers up on the mountain rather than down in the actual city of Sandpoint, which was once the place to stay, eat and drink for skiers. But while there have been changes to this pocket of North Idaho, Sandpoint is hardly dead in the winter and it will show you exactly how alive it is in February when it teams with Schweitzer for its annual Winter Carnival. The 10-day collection of events includes skiing events on the mountain and down in town, fire dancers, skijoring (we’ll explain that in a bit), shopping, eating, rail jamming, bonfires, a scavenger hunt, beer drinking, a spelling bee for adults (yes, you read that correctly), and a chance to make use of all that tacky ski wear you haven’t worn since Spring Break ’93. 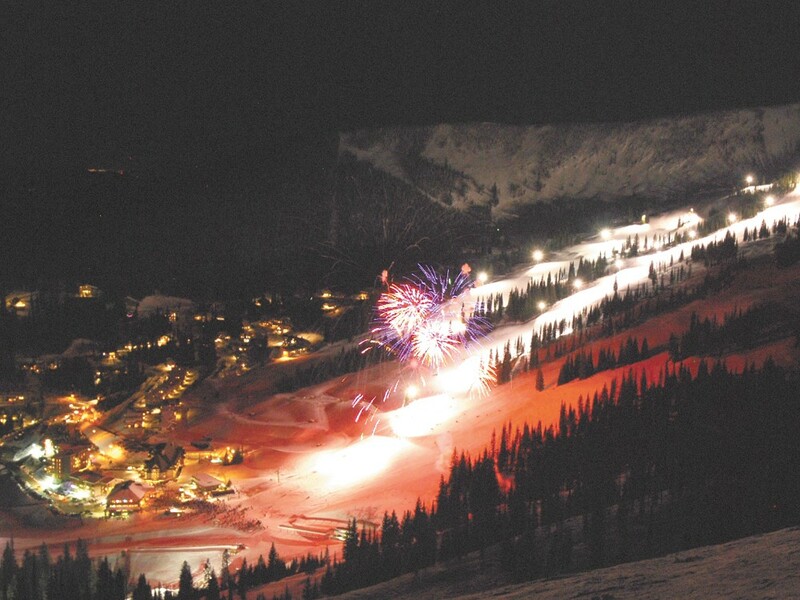 “There’s definitely a great atmosphere on the mountain, but we want a celebration in town, too. This is a draw to the town,” says Mack Deibel, a communications specialist with the Greater Sandpoint Chamber of a Commerce, the organization behind the Winter Carnival. “This is a way to celebrate what Sandpoint has to offer during the winter months,” he says. Winter festivals have become commonplace in winter towns across the country. Events like the Bend, Ore., Winterfest draws as many as 30,000 people during a three-day weekend in February and the Whitefish, Mont., Winter Carnival — now in its 54th year — is expected to draw crowds with its pirate-themed bash the first weekend in February. While there is plenty of skiing during the carnival up at Schweitzer, the event also holds skiing expos and contests down in Sandpoint proper. If the temperature warms up, fear not, says Diebel — they can truck in snow. This will provide ample coverage for skiers and boards to try their skills on a 100-foot-long rail and busting big air off of other snow-park features. If you’re just a spectator, you’ll enjoy the bonfires lining the event grounds. Other events, like the skijoring, which is essentially dog-powered ski racing, are held in part of the Sandpoint area that is sure to have snow at this time of the year. Keeping with the dog theme, there’s also a “keg pull” — a seemingly bizarre contest in which dogs drag empty kegs of beer across a snow-covered course. Sure, it’s a little weird, but it benefits the local animal shelter, so loosen up. The partnership between Schweitzer and Sandpoint also encourages winter tourists, many in town for the President’s Day weekend already, to get to know Sandpoint. There are shopping incentives and a passport you can use to get stamps from local businesses. Dining takes the center stage on Feb. 24 with the Taste of Sandpoint, a gathering of more than a dozen of the area’s restaurants at the Sandpoint convention center. There’s plenty to do around Sandpoint when it’s cold out, which is what the organizers of this carnival are wink-and-nudgingly trying to let you know. “Sandpoint is not just a great ski town, it’s also a great winter town,” says Diebel.